WEMPE introduced a revised version of the ADMIRAL product line. The result: high-quality nautical instruments that reflect the maritime lifestyle in a particularly beautiful way. The enclosure convinces in either high-gloss polished brass or a chrome plated surface. All instruments have white clock faces and a diameter of 125mm. The numerals are printed in Roman style. Next to the instruments that you already know from the other product series (mechanical bell clock, quartz glass clock, barometer, and tide clock) we also offer a combined instrument panel that consists of a double aneroid barometer, a thermometer, and a hygrometer. 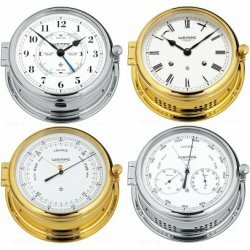 Particularities about the WEMPE ADMIRAL II Series are certainly the mechanical glass clock and the combined instrument panel in the edition with chrome plated housing, white clock face, and blue scale in two tones. The mechanical glass clock is furthermore equipped with a Swiss escapement functioning as a regulator.